We've seen a few interesting panoramic camera projects over the past few months but none of them capture panoramic video. Centr, which was launched by former Apple engineers and currently in the Kickstarter stage, is aiming to fill this gap. 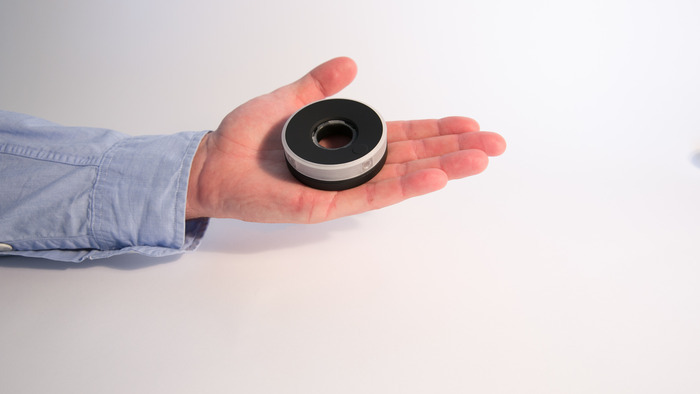 The camera is a doughnut-shaped device that records 360-degree video at 4K resolution and 60 frames per second. This is achieved by stitching together footage from four separate full-HD camera modules in real time. The resulting video can be interactively seen on a special viewer on the centrcam.com website or through a dedicated app on your mobile device. The app can also control camera settings or show a live-preview of the recorded footage via Wi-Fi link. You can also shoot with just one of the four cameras or create gigantic 20MP 360-degree time lapses. 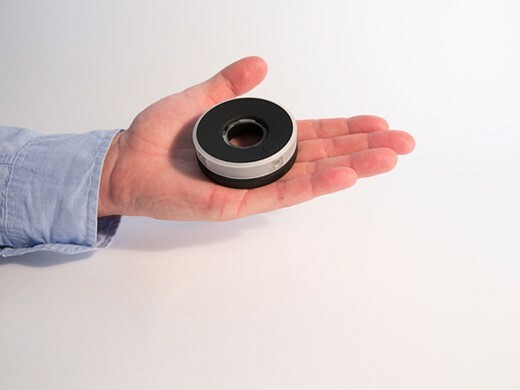 The Centr's doughnut design means you can hold it by the hole in the middle and no part of your hand will accidentally appear in the recorded footage, but the device is also compatible with standard tripod and GoPro mounts. The battery provides power for two hours of recording and comes with a quick-release for easy swapping. It's also splash-proof, allowing you to use the Centr near water. The web viewer is currently, at least on my machine, still a little unresponsive but browsing the 360-degree video is a pretty unique experience. It'll probably take some time for users to work out how to best use the Centr but if it looks like something you'd like to own as soon as possible, you can reserve it now by pledging $300 on the project's Kickstarter page. Centr is still looking for about half of its $900,000 funding with only 10 days left in the campaign. Head over to Kickstarter or watch the video below for more information. It may take a hundred thousands of years, but imaging will eventually get to a point where we no longer need to capture the photo ourselves. We'll just have to compose it from the sources available. All the DOF shots can be software rendered with no discernible difference to using a lens. This could have some interesting sports applications. Toughen it up and put this thing in a hockey puck! are these 110° HOFV meant diagonally? otherwise no 360°. btw: giroptic is also not sleeping.... similar if not better concept. In the future, we will watch movies in cylindrical screens. The audience will be in the middle of a coliseum with walls as the screen. We will "feel" the action from behind to front in REAL TIME. This gadget will be the first of many capture devices. Apple will by this patent? A different way of seeing, somewhat disorienting and yet really intriguing. The story about a child watching a clip 16 times is totally believable! The microphone(s) could definitely use a wind screen to make this an outdoor camera like the GoPro Hero. 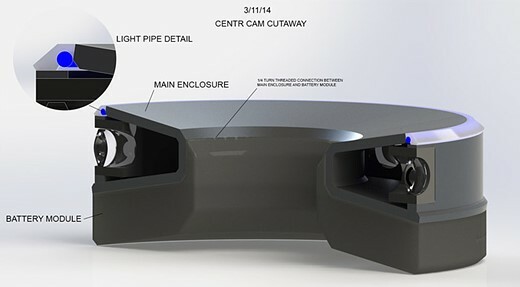 Hey, make this camera with a magnet on the base also! A Kickstarter project that I put some credibility, I hope it is accessible because I would like to have one. Well done. This will be just like the Ricoh theta and Lytro camera. Special software and images that are hard to post without their special software and some sort of expensive subscription. This is not 4K since max is 1080p not 2160p. You need to brush up on your math. 4 times 1080 is 4k. Got it? Did you take a stupid pill or what ? This camera shoots 720p or 1080p. 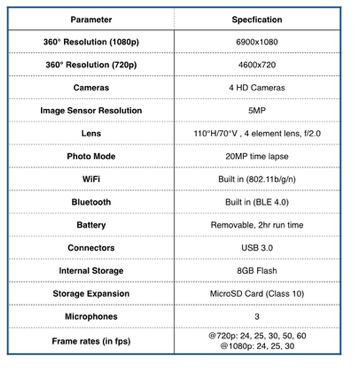 Look at the specs before you post. It only shoots 720p60 or 1080p30 max then makes a panorama. My GH4 shoots 4K UHD 3840x2160 or cinema 4K 4096x2160. How to lose your credibility and your audience: use the word 'awesome'. I had no idea I was accidentally reading The New Yorker. At first, I thought hey nice, it's like in real life, I can turn my head right or left to focus on what I find interesting! will it be available in HONGKONG ? And....what's that good for? I think Kickstarter "starts" to get rubished with tons of "ideas" no matter how usefull they are. They are in it for business, please don't kid yourself that they are here to the public a favour. "They are in it for business, please don't kid yourself that they are here to the public a favour." The big camera manufacturers are certainly in it for the money, too. Yet they use the JPEG standard format. If you think a proprietary format is needed to make lots of money, you are mistaken. Fact is, there's no need to use a proprietary standard for the whole image. Just add a sidecar files for projection information, use a standard image format and be done with it. They could embed some metadata in a standard image file; no need for unwieldy sidecar files. They're mostly interested in video rather than stills it seems. The same thing should still more-or-less apply, though. Read the FAQ on their product page. Videos are MOV files and stills are JPEGs. The next step is to start defining open standards for projection information.